Tens of thousands of mistakes delay payment, and in some cases, prevent payment of wages to hundreds of health workers employed through California’s In-Home Support Services (IHSS) system. NBC Bay Area’s investigation found more than 150 different instances since 2010 where those IHSS providers never got paid and a neutral hearing judge with California’s Department of Labor ruled they were owed back wages. And according to data obtained from California Department of Social Services, there were almost a half million instances of errors (422,063) involving paychecks that required human action to process from July of 2014 through June of 2015, the latest timeframe the full data is available. While those errors make up less than 4 percent of the entire statewide total processed during that time it still adds up to delays in pay for tens of thousands of workers. NBC Bay Area’s investigation found that when IHSS workers’ paychecks arrive late or not at all there are no provisions for penalties to be levied against IHSS. Despite millions of transactions during the course of the year reviewed, DSS data does not reflect that there is ever an error on behalf of the State of California’s IHSS. Administered by California’s Department of Social Services and overseen by local offices throughout the state, IHSS was designed to save taxpayer money by having the state pay for approved care delivered by qualified providers in the homes of people who need long term care, called recipients. That way, people in need, the recipients, don’t have to be institutionalized. 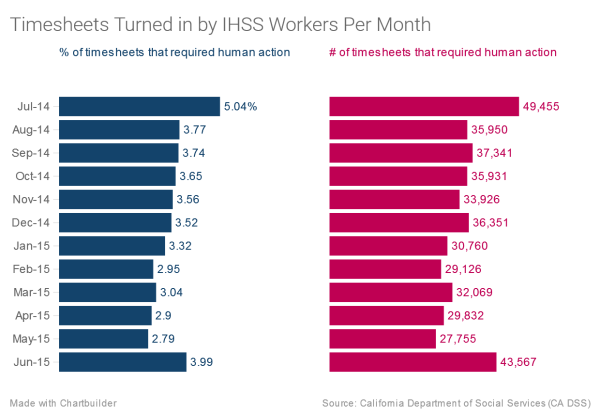 The State of California, through its IHSS program, awards recipients a certain number of provider hours a week which the state then pays for, depending on the recipient’s individual needs. Providers, even family members, can get paid by the state to take care of them where they live under IHSS rules if those providers meet certain qualifications. A year-long investigation by NBC Bay Area discovered the IHSS system is plagued by antiquated procedures. That system can often lead to paycheck delays lasting months for many workers. The Investigative Unit discovered participants frustrated by IHSS’ use of paper timesheets as well as recipients and providers who say mistakes with the hard copy form of reporting their hours, often leaves them in limbo, with no money and at times, little to no recourse. Joy depends on an IHSS worker ever since she was paralyzed from the waist down several years ago. She has to have an in-home worker help her with even simple tasks such as doing the laundry, going to the bathroom or taking a shower. “There's no monetary value that you could put on somebody like (an in-home provider) who comes (to my home) regardless if she gets paid or not,” Joy said. While Joy serves on the local Placer County IHSS Board she says the system, as it’s currently run, has to be reformed. Clark has to work within the system as it’s currently set up. She doesn’t have a choice. She cares for her 12-year-old autistic son, Jimmy, whose condition requires constant supervision. “He is autistic with developmental disabilities. And he needs twenty four hour supervision. He cannot be left alone for any amount of time,” Clark said. Even so, the IHSS rules restrict her ability to even do simple things such as go outside with Jimmy. That is, if she expects to be paid by IHSS. “They only pay for ‘in home.’ So any time we're outside that I don't get paid for that time (outdoors),” said Clark. Jimmy Clark and Tonya Joy are just two of about 450,000 California children and adults who are disabled, sick, mentally ill or otherwise need care by workers in the home where they live and paid for through California’s IHSS. Not all of them need in-home care permanently either. People, such as 73-year-old Jeanne Brown, who needed constant supervision and care for three and a half years, also need IHSS care. Brown survived a myriad of health problems; everything from a hip replacement, to vertebrae fusion, reconstruction of her right foot to treatment for nerve damage in her hands. Brown made it through those health crises in relatively good shape. But she said that when she was getting care she was in no shape to keep up with and adhere to the IHSS antiquated rules and procedures. Even though she was often barely conscious and certainly under the heavy influence of drugs such as Vicodin or Oxycodone which she took for the pain, under IHSS rules she was supposed to supervise and oversee her own care signing timesheets and keeping track of her providers’ work hours. When asked if she thought the system had taken advantage of her given her circumstances, Brown was unequivocal. As for workers who didn’t get paid, Brown said she hurt for them too. 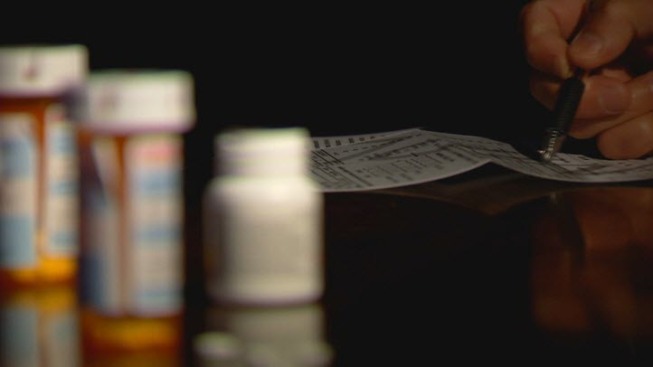 All of the recipients and providers who spoke with NBC Bay Area said that in some instances, when the IHSS workers don’t get paid they take out their frustrations on the recipients. The very people for whom they are supposed to be caring become victims. According to the most recent data available from the Department of Social Services in 764 cases, a delayed paycheck directly was caused by a paper timesheet or a provider’s paperwork. Despite numerous attempts to get a comment, a spokesman for California’s Department of Social Services declined to make the head of IHSS, Deputy Director Eileen Carroll, available to answer NBC Bay Area’s questions about this system on camera. Of the half dozen IHSS providers and recipients interviewed by NBC Bay Area all agreed that this paper by mail system has few checks and balances, leaving it wide open to mistakes as well as the potential risk of fraud and abuse. “I would make sure that there were enough people monitoring what's happening to the funds that they are being allocated and paid out to the employees,” said Jeanne Brown. When asked if, during her time using the IHSS system, she thought there was fraud and abuse going on, Brown, again, was unequivocal.